Know how lots of people advise "change the photo to black and white" to see if there is enough contrast in your quilt? Well, they're right. I just didn't know how to do that, until my boys got me an iPad for Mother's Day. And there is a black and white "filter" right there at the bottom of the screen. I'm thinking it looks pretty good, no? Well, while photographing it with the iPad, I noticed the "filters" button, and clicked on the "Mono" option. OH, NO! My "heart" is lop-sided! Well, too late. The top is pieced and it needs to go in the mail tomorrow afternoon. So, lesson learned: Take the black and white photo before sewing all the pieces together! 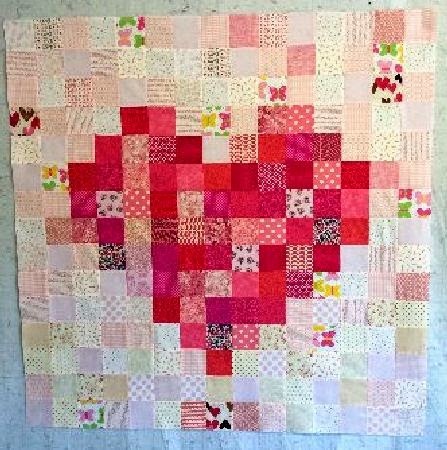 Luckily, Holly will think it's beautiful and the recipient isn't a quilter, so she won't notice! Oh, look! I just noticed this is post #499. That means a giveaway with the next post! I think it looks great! Who says hearts have to be perfectly shaped?!? But also, the recipient won't be looking at it in black and white, so it's still going to be a perfect heart to her! I love the filters on my phone camera. 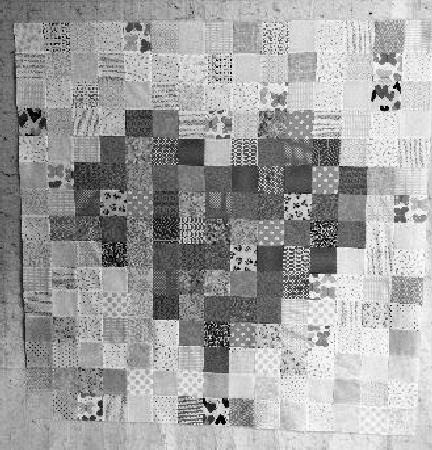 I usually put my blocks on the design wall then take black and white pics to help me balance my quilt. Then I keep taking the pictures as I adjust my layout. It is a great tool. Love the quilt. I think its adorable! And I bet the new mom will, too. Thank you for posting this! I didn't understand about the black-and-white thing, but this clearly shows it to me.... I am most definitely a visual learner! Loved your quilt...just like it is! I did not realize it was lopsided looking at it in color. I think it looks great. Thanks for the tip. I will definitely try it. However, I think it looks great as it is. She will love that you made it especially for her! I think all of our hearts are a little lumpy and lopsided and short of perfection, but they are what we have. So, go for the realism in your quilts!